I’ve always been a loyal Federer fan and still am. But it’s been about three weeks since Novak Djokovic won the U.S open 2011 and I’m still reliving the epic final between Djokovic and Nadal. The message is clear – There is a new champ in town and his name is Novak Djokovic. For the past couple of years, Nadal has slowly and steadily become the yard stick for guts and glory in tennis. But in the last 8 months, that has started to unravel and quite simply put, Nadal had been weighed, Nadal had been measured and Nadal has been found wanting by Djokovic. So what has changed this year? I can’t quite put my finger on it, whether it’s the gluten-free diet, a new training regimen or the rumored hyperbaric chamber, but apparently some switch has been flipped and Novak Djokovic has emerged somewhat terminator-like – invincible, inexorable, inexhaustible and unbeatable this year. There were moments throughout the year where Djokovic seems to just absorb Nadal’s determination and return it with interest. I did not realize until the U.S open final that I was waiting for a moment like this where the Federer – Nadal duopoly would be broken. And broken it has with such finality by Djokovic. Djokovic’s win record is 64 – 2 after the U.S open and to borrow a phrase from Rocky, he has done nothing but “Eat lightning and crap thunder” all year. After a virtuoso display of tennis by Djokovic all year, there is one jaw-dropping moment between Djokovic and Federer in the U.S open 2011 which has made me a true believer in Djokovic. After saving one match point with an impossibly angled forehand return, Djokovic turns to the crowd with one more match point remaining to be saved and raises his arms as if to say “Are you entertained?”. For lack of a better word to describe the moment – gladiatorial, pure testicular fortitude and pizzazz. A curious thought struck me which watching Djokovic and Nadal stand next to each other at the U.S open – Physically Nadal is to the Hulk what Djokovic is to Bruce Banner. Djokovic positively looks frail compared to Nadal, but his shots seem to land with such thundering power and precision, it may very well be Thor swinging his Mjolnir. All praises aside, a strategic analysis of Djokovic’s shot making is in order to comprehend his meteoric rise in 2011. But that will be grist for another post. Also another curious thought, the triumvirate Djokovic, Nadal and Federer have, in a way, morphed into each others Achilles heel. Djokovic has Nadal’s number inside out and like-wise Nadal for Federer. Only Federer seems to be a threat to Djokovic at the moment. That is a strange Achilles heel triangle indeed! There is a new nightmare in town for Nadal and his name is Novak Djokovic. Nadal’s determination is nothing to be scoffed at. One thing I’m certain is that Nadal will never quit trying to conquer his Djokovic demons, while Federer seems to have more or less succumbed to his Nadal ones. Nadal’s vaunted weapon against his opponents has been his lefty top spin forehand. But Djokovic has more or less neutralized it with his tremendous backhand down the line as well as the cross-court. Nadal’s speed, agility, reflexes and pit bull tenacity has been matched and surpassed by Djokovic and in fact, Djokovic seems to be the faster of the two. Another headache for Nadal is Djokovic return of serve which is probably the best in the world. If Nadal has to win against Djokovic he will have to find a way around the aforementioned puzzles. Admittedly I’m a Federer fan, but Federer doesn’t seem to be floating around like a butterfly and stinging like a bee that much anymore. Those moments of magic which used to come fast and furious have slowed quite a bit. Compared to Djokovic’s on court movement, seems like Federer has put down roots and hitting his shots. Would I count Federer out? There probably was or is no tennis player at age 30 who moves and plays like Roger Federer and probably never in the future as well. Collectively, what Federer has accomplished will inspire generations to come. Judging Federer on the last couple of years will be the most myopic of judgements. Again to borrow a phrase from Rocky, every great fighter has one great match left in him. Seems like the Swiss maestro has several in reserve. The Lion is in it’s winter, but it is still a Lion. Djokovic had a taste of that first hand at the French Open semifinals this year and almost a second at the U.S Open. The best player in the world wouldn’t dare count the King out and neither will I. What would I like to see of Federer? Master that topspin forehand of Nadal and start throwing some hurtin’ bombs himself. Start looking hungry again so I can root for him, win or lose. Chuck that complacency down the drain and never go down without a fight. At least one more time, I want to see Federer unleash hell on Nadal who is in his prime. Come to think of it, I never seen Federer go for broke. It’s time to let loose and let the outcome be damned, a la’ Djokovic. I’m not a betting man, but I’m willing to bet that the stars will align and the Federer will be resurgent for at least a few more Slams. What is in it for us tennis fans? If ever there was a rivalry of a lifetime, this is it and we bear witness to it.The likes of Federer, Nadal and Djokovic repeating again as rivals is literally slim to none. There are more battles to be waged among the triumvirate both exhaustingly physical and mental and I hope their bodies and mind will be up to the task for many more years. As to the new shining star in tennis, looks fairly certain that what we seen this year will be Novak Djokovic’s new normal. That’s great news for tennis fans and the tennis world and quite possibly the worst for anybody ranked below No.1. Recently, during an interview, I was asked about tools I use for .NET development. That was one topic I had way too much information to expound on. Over the years, I accumulated more than a dozen tools that I use on and off during development. Some I came across as a case of need while others on a lark. Without any further ado, here are five of my favorite tools that I use almost on an everyday basis. ReSharper – If you want to eliminate coding errors and smells, perform on-the-fly code analysis, refactor like you were born to do it, figure out latest syntactic sugars and navigate code like you had the need for speed, this is it. I was hooked when I started using ReSharper four years ago. I do admit that it was quite a shock to turn ReSharper off and find out I stumbling around Visual Studio trying to accomplish some common tasks. Eventually things did come back but yes, addiction can be a problem! TestDriven.NET – TestDriven.NET is a Visual Studio add-on that does only one thing – Unit Testing and it does that with aplomb. TestDriven.NET pretty much hooks into any Unit Testing engine and enables you to run unit tests right from any method in your code. For those who already use it, “Repeat test run” – now that’s sweet. WinMerge – Though WinMerge can be used as a standalone text compare tool, where it really shines is as a Visual Studio add-in for text compare and code merge from source control. Just to tell you how much I use it, I can’t remember the last time I used Visual Studio’s own source code compare and merge tool, if it had one. Lutz Roeder’s Reflector – Ever had those dlls which you wanted to rip open to see the source code, even Microsoft’s proprietary ones? Reflector x-rays them for you. There are some brilliant add-ins as well for Reflector in Codeplex like CodeMetrics, Graphs, DependencyStructureMatrix, SequenceViz and AutoDiagrammer. It’s a real shame RedGate bought Reflector and made it a paid software. There are some more tools which I feel are an absolute must. But that’s fodder for another post. I’ve been an IT consultant for several years now. At the end of every contract, I had this problem where I would almost always run out of minutes on my AT&T cell phone plan, while fielding calls for potential new contracts and taking lengthy phone interviews. Ah yes, enter the rollover minutes – that’s something that kept my head out of water for a while when on a new contract quest. Personally, I think it’s a great feature and I was diligent in saving up on the minutes. But it can take you only so far. I burnt through my rollover and plan minutes faster than a burning haystack on several occasions while on the job search and interview cycle. The resulting phone bill put a hole in my wallet the size of Texas. Yes, I know what you are thinking – I did have a land line. But the limitation is that you would list only one main phone number in your resume where vendors and clients can reach you at any given time whether you are at work, outside or at home. Inevitably that number is your mobile phone. Enter my savior, Google Voice. I knew about Google Voice for several years since it was in the beta stage. I had a vague idea how it worked but never thought about trying it before. Chalk up my unwillingness/procrastination/laziness to one of those conundrums in life that you can never answer like ‘What women want?’ or ‘Why can’t you straighten a dog’s tail?’ which is an interesting topic by the way and I plan to get to it sometime. After using Google Voice, the difference is like night and day. It is an absolutely brilliant product and for the life of me cannot imagine how I got around without it all these years. The concept is deceptively simple – Google will route all calls to a number of your choosing to any number of landlines and mobile phones you own simultaneously. That line says it all. I have no idea of the hoops Google had to jump, arms of service providers they had to twist, or black magic code they had to write to get the service to work the way it works today. It just works and works it does like a charm, at least for my purposes. All I had to do was to sign up for a Google Voice number and on the settings page list my land line and mobile phone to which all calls should be forwarded simultaneously. The Google Voice number is what I list on my resume. That’s all there is to it. Now there are numerous features and cutting edge new stuff on Google Voice and its best left to Google Voice’s website to explain all the myriad features. Just in case, did I mention Google Voice is free? Call Forwarding – Obviously call forwarding to my different phones. If I’m home, I always pick up the land line. Pre-screening Callers – Google Voice asks callers to identify themselves. This is great when you lift up the phone and you can hear an announcement about who the call is from. If you are like me where 60%-70% of calls you receive are irrelevant regarding new positions, you can just redirect the call to voicemail. Voicemail Inbox – I access my voicemail mostly through Google Voice’s inbox on my PC. You can do it via your smartphone as well via the Mobile Google Voice app. Voicemail Transcription – This is a nice icing on the cake but the transcription can be off quite a bit when the caller has an accent. Personalized greeting for different callers. Mobile Phone App – I use the Google Voice app for my Android phone. Address Book – Callers can be added to Google Contacts. I selectively add contacts with their details. When a caller who is already in the address book calls, I get the ID of the caller from Google Contacts in my mobile phone. If you have Caller ID enabled on your land line, you will get the usual Caller ID. Text Message – It’s free if sent from Google Voice website/inbox. Not sure about using it from the Android app. I don’t use it that much but compelled to list it as many of my friends text like there is no tomorrow. Google Voice has been one of the best productivity and cost saving tools I have come across as an IT consultant while on a hunt for new opportunities. It’s easier to setup than you think and the productivity boost is tangible almost immediately. I maybe late to the Google Voice party, but hopefully this posts helps somebody out there as much as Google Voice has helped me. I dreaded the thought of watching another attempt at bringing Sherlock Holmes, Dr. John Watson and London to life. Personally, I had concluded that the brilliant Granada series starring Jeremy Brett as a living personification of Holmes would never be topped. Any attempt which doesn’t stand up to that mark would be an affront to Sherlock fans and to Sir Arthur Conan Doyle’s legendary characters themselves. I’m happy to let you know that Conan Doyle would not be turning in his grave any time soon. The writers of the BBC Sherlock Series, Steven Moffat and Mark Gatiss had done the impossible – shepherded Holmes and Watson into the 21st century without compromising the vision of Conan Doyle as to the characterization of Sherlock Holmes and Dr. John Watson. The series bristles with wit, charm, astounding sequences of deductions and some clever who-dun-its. The writers have made sure that the juice is worth the squeeze. 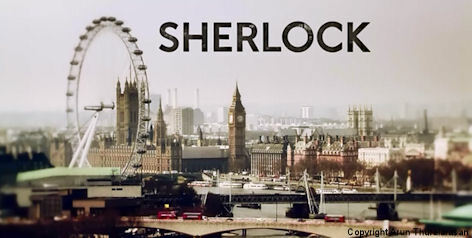 The series is set in modern-day London. Victorian era houses, hansoms, castles and mist is replaced by modern-day London’s chaotic hustle and bustle, skyscrapers and cabs. Shots of London are artfully fast forwarded, blurred and tinted to dramatic effect. 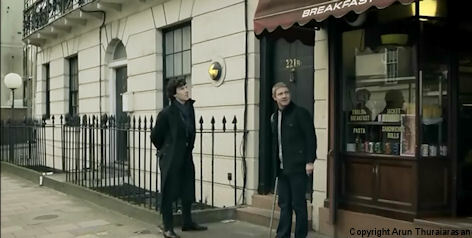 Sherlock’s favorite tools are texting and web surfing which powers his extraordinary deductions. This firmly grounds the series in the present day and any reference to the past is gradually and inexorably forgotten after watching the lead actors breathe new life into their roles. The casting of Benedict Cumberbatch and Martin Freeman is inspired. Benedict Cumberbatch is a revelation as Sherlock Holmes. What Cumberbatch brings to the table is that physically he looks like no other actor, projects a certain gravitas and intelligence which has not dimmed through the season, straddled the fine line between manic intensity and madness and makes arrogance seem like a virtue. The only one who did this better is the late great Jeremy Brett. Brett set an impossibly high bar with a tour de force performance as Sherlock Holmes. His Holmes was a force of nature, impossible to contain and best left to express itself until it was spent. Cumberbatch probably knows this and wisely doesn’t channel Brett. Instead he has given his own spin on playing Sherlock as slightly asperger-ish, high-functioning sociopath with arrogance matched only by a truly genius level brain. Cumberbatch is a worthwhile successor. Would Jeremy Brett approve? I think he would. There can be no Sherlock Holmes without a stalwart Dr. John Watson to define him. Martin Freeman plays an invalided soldier and medic back from Afghanistan with post-traumatic stress. He has embraced the role and made it his own, completely unlike any other actor’s performances as Dr. Watson. He brings a certain warmth laced with plenty of deadpan humor to the series. He is the long-suffering room-mate and everyday man of the series and though his Watson is less physically imposing and mentally endowed than Sherlock, he is no pushover and holds his own against the great detective knocking him down a peg or two with some acerbic wit. Bloody awful cabbie anyone? Chemistry cannot be manufactured and it shows in the pair’s performance as Holmes and Watson. They bounce lines off each other like a squabbling old couple and yet there is a strong undercurrent of friendship and loyalty simmering underneath. The writers also recognized the incongruity of two bachelors staying together in this day and age and have fun with a running gag about the pair being mistaken for a gay couple. Martin Freeman is a hoot to watch trying to explain away their status every chance he gets. As actors, Cumberbatch and Freeman look like they are on two different parallel roads and never the twain shall meet. Yet somehow their performance as Holmes and Watson complement each other and possibly even raise each other’s caliber a couple of notches which endows the pair a genuine ‘X’ factor. That is what defines a winning combination. It’s a pity that there are only three episodes in season 1 – A Study in Pink, The Blind Banker and The Great Game. 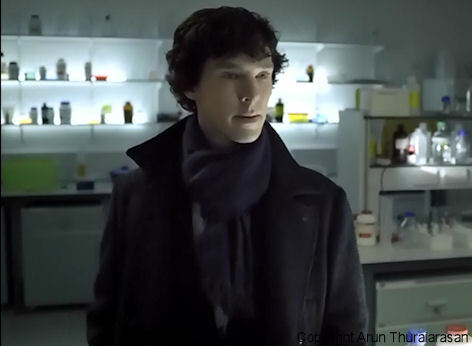 But they are sufficiently lengthy at about one and half hours to whet the appetites of Sherlock fans. Personally, I felt a A Study in Pink and The Great Game are far superior in content and execution to The Blind Banker, but all three are highly entertaining nevertheless. Strong supporting characters playing detective inspector Lestrade and Mrs. Hudson add considerably to the enjoyment of the series.There are some fantastic villains in the series, one who is genuinely off the rails, but unfortunately nothing more can be said without giving out plot details. A quick heads up – some of the dialogues can be a bit incomprehensible with the British accent and blindingly fast deduction sequences. Unless you plan to make friends with the rewind button, closed captioning would serve you well. If you are looking for an intelligent, well-thought out crime drama with a heart and soul that respects your intellect, look no further than ‘Sherlock’ from BBC. Highly recommended to get your blood pumping and to clear those cobwebs from your brain.